© Provided by CBS Interactive Inc. Elite Afghan forces trained by the U.S. respond to terror attacks in the country. Afghanistan's Crisis Response Unit 222 is the country's most powerful weapon in the fight against Taliban and ISIS militants. The team swarms onto the scene at the first sign of trouble. When a terrorist attack is underway, the unit is the one to stop it, and they react within five minutes of getting the call. 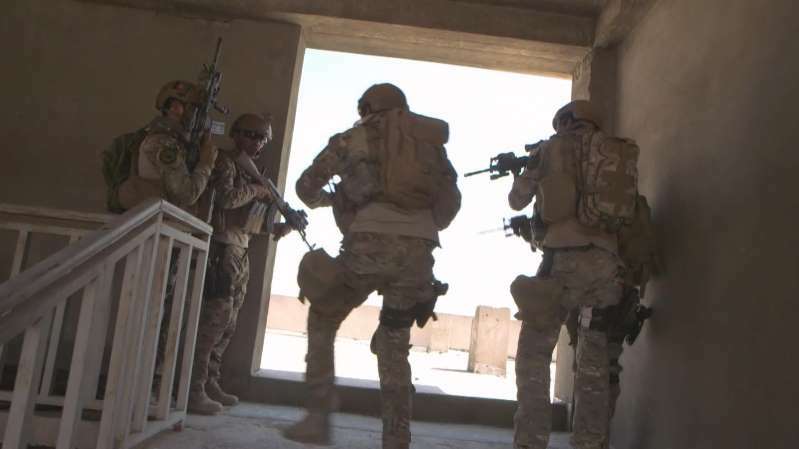 CBS News watched as the U.S. trained counterterrorism forces responded to a simulated complex attack — an explosion, followed by clearing militants room by room. It's exactly the kind the kind of training you'd see with U.S. forces, because they're being trained to think — and fight — like Americans. If only there were more of them, because they're stretched beyond the limit. An elite squad of about 50 is about all there is to take care of Kabul. The regular Afghan army has suffered from a series of surprise Taliban attacks. In just one week last month, the Taliban killed 200 Afghan soldiers and police. The Taliban is now "openly active" in 70 percent of Afghanistan, far more than when the majority of American and NATO combat troops left in 2014. There are only around 14,000 U.S. troops left, with a primary mission to train and advise Afghan forces. The Taliban have also reached the outskirts of the capital, where a local CBS News cameraman conducted a rare interview Monday. One fighter said the 17-year war will "return Islamic law to power," and said if foreigners don't leave, they have "1,000 suicide bombers ready to sacrifice their lives." CBS News traveled to the one district in Kabul that comes under attack more than any other. Attackers have been using so-called sticky bombs to blow up cars, and they've assassinated political candidates in the past few weeks. A tiny office is actually the headquarters where police chief Besmellah Taban keeps track of attacks with a map, Post-It notes and Christmas lights. A reminder of the dangers he faces coming to work each day sits on his desk: the photo of his former commander, who was killed in a suicide bombing. It may be America's longest war, but it's one being fought here on Afghan soil. And nobody is more tired of the fighting than the Afghans themselves.